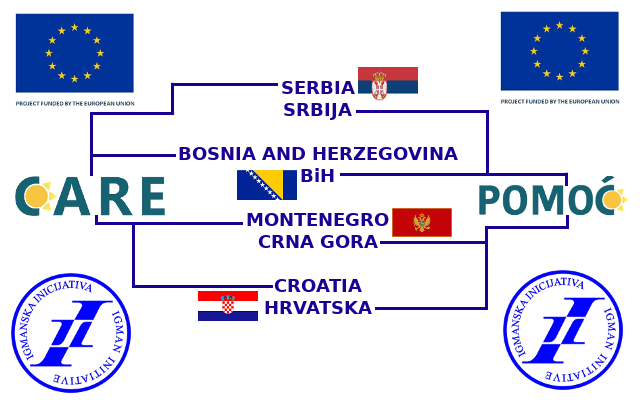 Core organisations of the Igman Initiative are Center for Regionalism, Serbia, Civic Committee for Human Rights, Croatia, Forum of Tuzla Citizens, B&H and Initiative for Regional Cooperation, Montenegro. General Secretariat of the Igman Initiative is the Center for Regionalism from Novi Sad Serbia. General Secretariat has been authorized by other three core organisations to sign the contracts with donors and thus represent the network, among others, in the following areas: monitoring implementation of projects in accordance with the contract; serving as intermediary for all communications with donors; supplying all documents and information which may be required under the contracts (such as narrative and financial reports) by the donors; informing the donor of any change in the legal, financial, technical, organisational or ownership position; responsibility in the event of audits, checks, monitoring or evaluations; full financial responsibility for ensuring that projects are implemented in accordance with the contract, etc. Igman Initiative is governed by the Supervisory Committee consisting of four co-presidents from Croatia, B&H, Serbia and Montenegro. The Supervisory Committee is responsible for regular defining and upgrading the global policies and positions of the organisation. It represents the organisation as a credible and responsible institution. 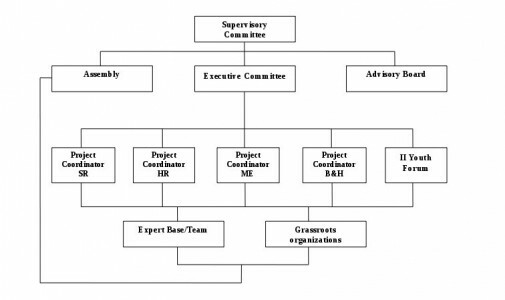 The Supervisory Committee also manages all strategic aspects in the performance of activities by the organisation, such as lobbying, advocacy and fundraising. 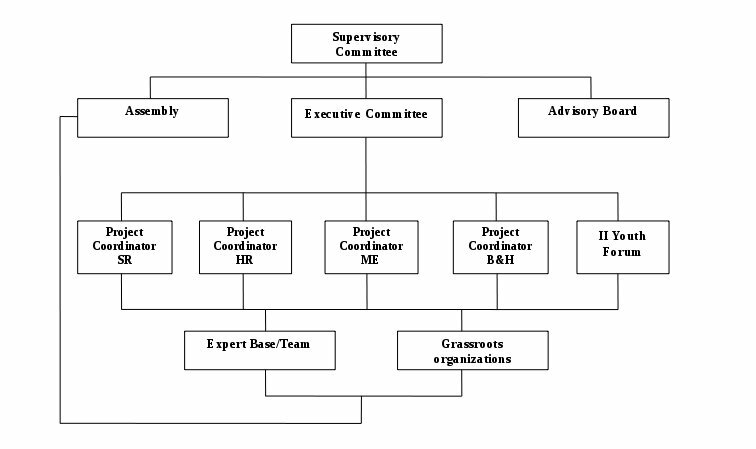 The Executive Committee consists of project supervisors, one from each country, i.e. one from each of the coordinating organisations. The Executive Committee is responsible for effective supervision and implementation of the programme and activities of the network. It is also responsible for monitoring and evaluation of the effects of the performance based on clearly defined objectives, results and indicators. Findings resulting from monitoring and evaluation are regularly embedded in the strategic positioning of the organisation and project work. In each of the four countries there is an Igman Initiative committee counting five members. The members of the committees are prominent experts, civic activists, scientists, media representatives former and present government officials and prominent individuals from the sphere of and other respectable public figures. The Advisory Board of the Igman Initiative is comprised of 20 members, i.e. 5 members from each committee per country. The Advisory Board provides non-binding but informed guidance and serves as a reference board for the Supervisory Committee. Assembly of the Igman Initiative consists of all members of the network. They present, asses and design projects at joint sessions. To ensure quality analysis and impact on the ground, multi-sector expert groups are occasionally established to deal with specific topics. The Igman Initiative holds its sessions twice a year, alternately in each country and hosted by a country’s co-president. The Supervisory Committee is responsible for setting an agenda for each session and deciding on which priority issues will be assessed. 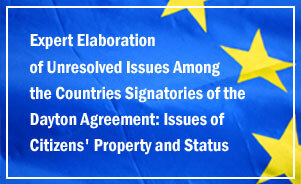 All decisions regarding activities and engagements of the Igman Initiative are made after an open debate among the members of the Assembly, resulting in a consensus. Final decisions are made by a majority vote and not by the leadership imposing their positions. So far, there have been no problems in this regard. In fact, this method has strengthened participants throughout their engagement. Each of the core organisations has delegated one project coordinator responsible for the coordination and implementation of the network’s programme and activities in each country. Also, there is in each country an external expert team with which the Igman Initiative regularly cooperates. This joint external expert base serves for development, coordination and implementation of expert-based network’s activities. A majority of experts are either representatives of local and national member organisations of the Igman Initiative or representatives of government institutions at local or national level.